Our guide to Dallas will help you find the best frozen yogurt shops in Dallas Texas. Dallas and Fort Worth, separated by 30 mi of suburbs, aren't exactly twin cities -- they're more like cousins who squabble more than they get along. Their roots are different, yet intertwined. Dallas has almost always been a center of trade, built on the ideals of capitalism and progress -- and great leaps of faith. Fort Worth's prosperity was established when the town became a stop on the Chisholm Trail, and continued when the city became a major railhead. The cattle that were herded through town more than a century ago still define the city, and its nickname, "Cowtown," persists. In Dallas, image is almost everything. There's a struggle between preservationists and those who prefer to embrace progress -- even at the expense of bulldozing pieces of the past. It's hard to imagine the flashy, glitzy Victory Park -- Dallas's newest entertainment district -- fitting in anywhere in Fort Worth. The city and its people desperately want to be on the cusp of trends rather than following the masses, and they often take themselves very seriously. But Dallas has the results to back up its persona -- the city is filled with homegrown success stories, booming businesses, and, increasingly, an evolving emphasis on the arts. There are tons of great frozen yogurt shops in the city of Dallas, our city guide will help you find the best frozen yogurt shops. You may have a hard time deciding what to do in Dallas, but we make your decision easy. 11700 Preston Rd, (214) 691-9319 - Gooeys Treats is a frozen yogurt shop located in Dallas TX. 13350 Dallas Pkwy, (972) 239-2228 - OrangeCup is a frozen yogurt shop located in Dallas TX. 1800 Main St, (972) 414-4041 - Yogen Früz provides delicious and nutritious frozen desserts, just what you need to live a healthy and active lifestyle. 2323 N Henderson Ave, (214) 823-1707 - Natsumi Gelato & Frozen Yogurt is a frozen yogurt shop located in Dallas TX. 3699 McKinney Ave, (214) 520-2722 - OrangeCup Natural Frozen Yogurt is a frozen yogurt shop located in Dallas TX. 3797 Forest Ln, (972) 481-7755 - I Can'T Believe It's Yogurt is a frozen yogurt shop located in Dallas TX. 3800 McKinney Ave, (214) 521-7888 - Yumilicious/Yogilicious Selfserve Frozen yogurt West village Dallas is a frozen yogurt shop located in Dallas TX. 4447 N Central Expy, (214) 219-9646 - Berry Berry Frozen Yogurt is a frozen yogurt shop located in Dallas TX. 5301 Alpha Rd, (972) 386-7677 - Yogurt by Me is a frozen yogurt shop located in Dallas TX. 5450 W Lovers Ln, (214) 353-2644 - I Heart Yogurt is a frozen yogurt shop located in Dallas TX. 600 N Pearl St, (214) 880-8677 - Yumi Yogurt is a frozen yogurt shop located in Dallas TX. 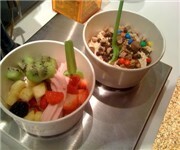 6859 Arapaho Rd, (972) 386-8865 - Froyo Workshop is a frozen yogurt shop located in Dallas TX. 70 Highland Park Vlg, (214) 252-0003 - The purest, creamiest frozen yogurt featuring live & active cultures that are low in fat, high in calcium with more than 40 toppings available. 8411 Preston Rd, (214) 360-9449 - OrangeCup Natural Frozen Yogurt is a frozen yogurt shop located in Dallas TX. 8687 N Central Expy, (214) 890-7710 - OrangeCup Natural Frozen Yogurt is a frozen yogurt shop located in Dallas TX. There are plenty more frozen yogurt shops in Dallas. See all frozen yogurt shops in Dallas Texas.